With three kids, if we didn’t have a fantastic babysitter, Jeff and I would never have a conversation from beginning to end without interruption. We’re working on teaching our kids the art of being polite and not interrupting while other people are talking – but they are fighting the lesson like the future of all civilization depends on it. So once every week or two, we get a babysitter and head off into our lovely Savannah. Our favorite restaurant is always crowded so we squeeze into seats at the bar and order our food so we don’t have to wait in line for a table – because our kids are at home and we’re allowed to sit at the bar – and because who wants to wait in line on date night?! I love my kids so much but I wouldn’t trade this time with my husband for anything. It is wonderful to be able to talk about the important things that are going on in our lives without interruption. But it is even better when we run out of important things to talk about and are able to just relax together. To tell the stories that we didn’t find time to tell during the busy week. To laugh with (okay, at…) each other. To spend time that is more enjoyable than productive. If you prefer organic, but choke every time you pay for boneless, skinless chicken breast, incorporate the whole chicken into your repertoire. The meat makes a great meal then if you toss the bones into your slow cooker after dinner, you can make a wonderful chicken stock that quickly turns into chicken soup the next day. Here is a similar idea in which Turkey Wings for dinner turn into turkey stock. If you purchase your whole chickens from the butcher, ask them to cut the chicken into quarters for you. It is typically a service the butcher will provide at no cost. If you purchase your chickens from the grocery store and have to quarter them yourself, don’t panic! It is not hard. Here is any easy tutorial. I have included the tutorial address in the recipe below just in case you need to find it after you have printed the recipe. This recipe uses two whole chicken that have been quartered - because that is what my family of 5 people requires and because we prefer organic chickens which are smaller because they have not been feed antibiotics to increase their mass. I usually have a couple of pieces left over for lunch the next day. 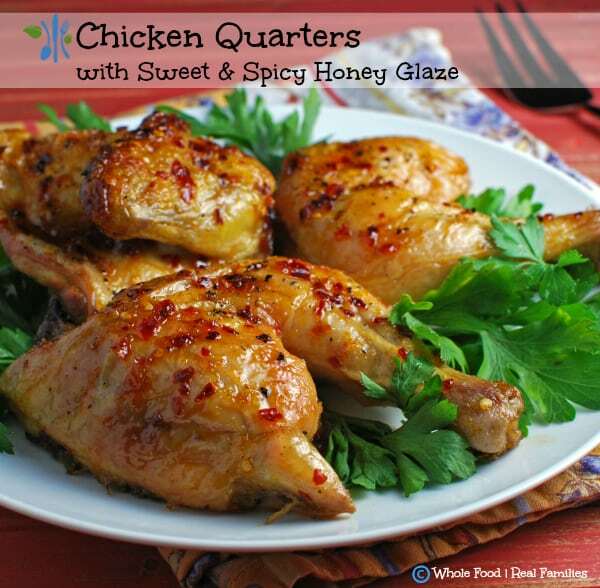 If you prefer to use one chicken cut into quarters, cut the other ingredients by half to reduce the amount of glaze. cayenne pepper to taste (optional) only if you want to turn up the heat!! In a small sauce pan, add honey, the juice from both oranges, the zest from both oranges, red pepper flakes, and cayenne if you are using it. Bring to a low boil over medium heat then reduce the heat letting the sauce simmer slowly and reduce until syrupy. If your chickens are not already quartered and you need to do it yourself, don't panic! Here is a video and written instructions if you have never done it before: www.thekitchn.com/how-to-cut-up-a-chicken-home-h-108742. Salt and pepper the chicken quarters well. Place chicken pieces on a baking sheet or in a casserole dish. I prefer a baking sheet because I cook 2 chickens at a time and it gives me more room. Keep in mind that there will be some water that bakes out of the chicken so your baking sheet should have a rim to prevent it from spilling into your oven. (Because, who wants to clean the oven after dinner.) Don't overcrowd your chicken. Roast the chicken for 30 minutes. Remove the chicken from the oven and either brush liberally or dunk (with tongs, of course!) the chicken pieces into the sauce and return them to the pan. Put the chicken back into the oven for 10 minutes. Remove chicken the second time and apply the sauce a second time. If I have any left in the sauce pan, I pour it over the top of the chicken. Return chicken to the oven again, cooking for 5-15 minutes or until the juices run clear and the internal temperature of the chicken reads 165 degrees. Enjoy! Yup, yup definitely gotta make this…I even featured it as one of my faves from last week’s #Foodie Fridays!!! Thanks for linking with us!!!! It looks absolutely delicious! I’d definitely like to try your recipe! Pinning! Thanks for sharing it with us at Foodie Fridays. After a week off for Thanksgiving, we are back this Thursday night! I hope you will be joining us!